How timely because lunch sets were available and they all look pretty yummy! The menu unfortunately was only in Japanese so it helps to be able to deal with a smattering of the language, especially the names for the various “zaiiryo” used. Otherwise, the photos for each set basically shows everything. Despite the lack of an English menu, there was a staff member who spoke rather decent when we were there. So I had no problems ordering at all, transiting between English and my impoverish command of food-related Japanese. I chose for myself a donburi with cured tuna, sprinkled generously with furikake and topped with grated daikon radish, chopped negi and julienned myoga ginger. 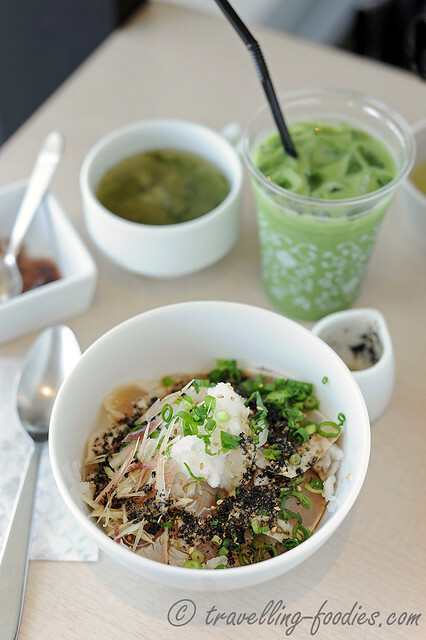 The set also comes with a miso soup, a simplified shiratama anmitsu dessert and a cuppa icy cold matcha! This is probably as close as one can get for a japanese inspired donburi here at Nana’s Green Tea. The tuna seem to be cured as a chunk before being sliced into thin pieces, with the curing process not unlike cerviche which we are accustomed to. The cured surface bore good contrast against the still tender interior, not to mention being quite adequately seasoned. 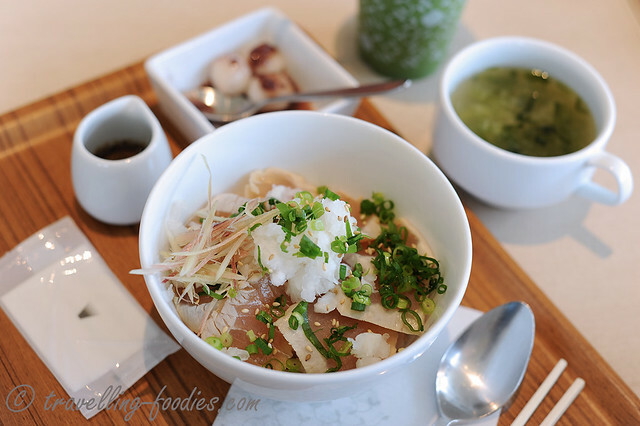 The condiments and embellishments help to make a simple donburi more memorable. J opted for a Japanese pork curry donburi and it turned out to be more spicy than we thought it would be. 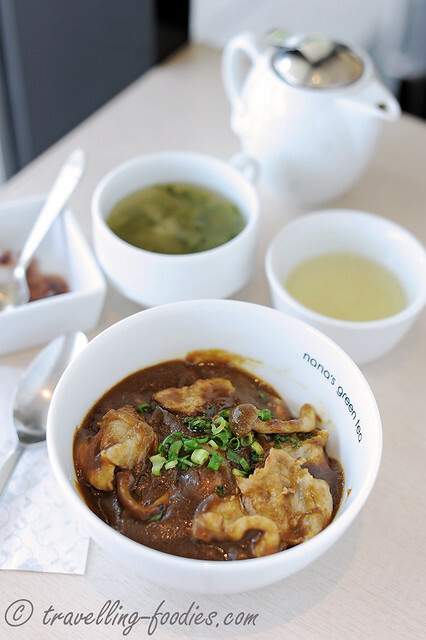 While the spices used in the concoction seemed rather heavy handed, the pork slices were uber soft while the shimeji mushrooms that were stewed together with the curry sauce had a lovely chewy bite to them. The donburis are really small, more for ladies, so we ordered one more to share, though admittedly, I ate most of it! This is the most “un-Japanese” one of the lot. 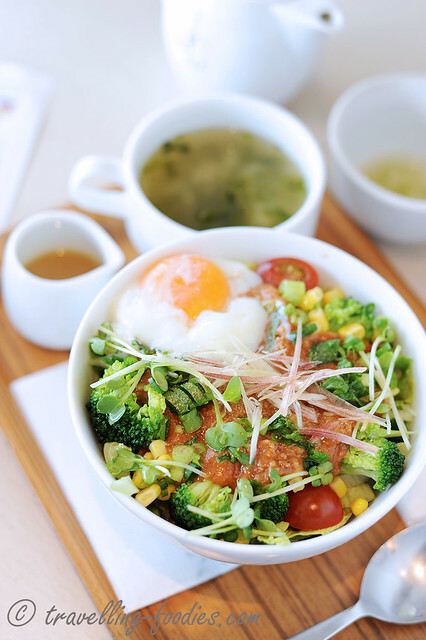 A beef bolognaise sauce topping over rice, dressed with assorted salad condiments like corn kernels, cherry tomatoes, broccoli, pea sprouts, myoga ginger, negi and not forgetting an onsen tamago! A riot of colours! Seemingly like a mish mash of everything. Curious to how the concoction of seemingly disconcerted ingredients would go with each other, I broke the yolk and gave everything a good mix. It was surprisingly tasty!!! 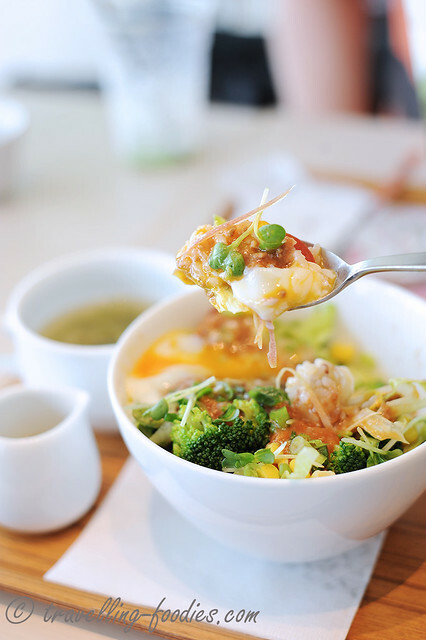 Lovely silky textures from the runny half cooked egg against the crunchy vegetables. The bolognaise sauce provided the base for the flavours while the julienned ginger gave each mouthful a good zing! It’s really interesting I thought and most definitely look forward to replicating this for one of my homecooked lunches! All the sets came with an option to include a drink, which we chose ice matcha for both but one can always go for houjicha latte or matcha frappe etc. Or you can also include one of their signature desserts for a small top-up. 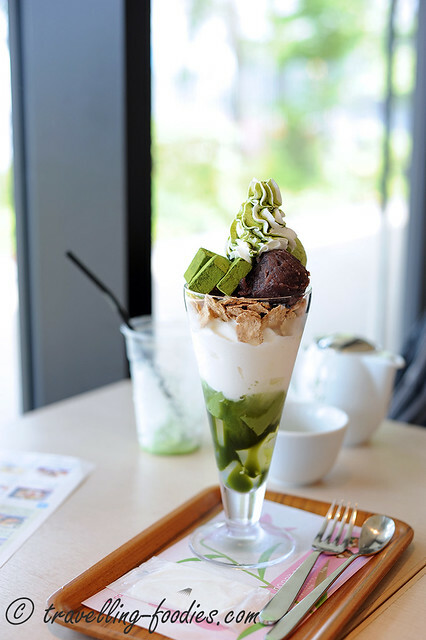 And of course, the highlight of the visit to Nana’s Green Tea must surely be to try out their parfait desserts. These parfaits came as part of lunch set promos at that time and were remarkably cheaper to have ordered it as a part of a set than to have been to eat it alone. We chose one which had a good scoopful of anko (red bean paste), pave matcha chocolate truffle(aka nama chocolate), and kanten cubes with matcha sauce at the base, in addition to the soft serve spiral and corn flakes! It was quite enjoyable, especially when it comes only at a fraction of the price we were expecting to pay! 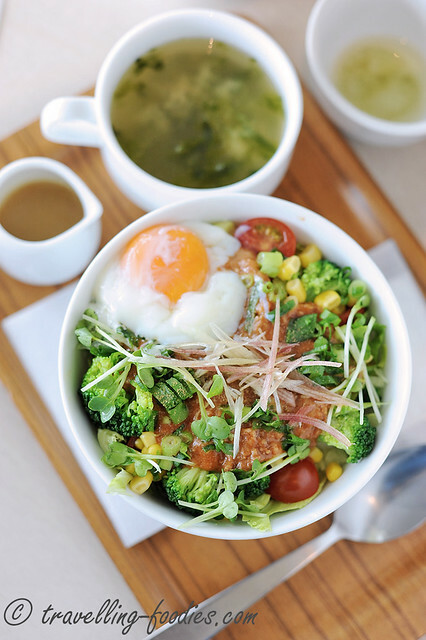 So if you happen to be visit the Tokyo Skytree, (1) go early to avoid the touristy crowd, (2) go on a weekday, (3) swing by Nana’s Green Tea for lunch after that, a good pitstop to refuel before carrying on with your afternoon shopping and sightseeing! We really love the dining environment of this place. Despite being full-house the time we visited, the atmosphere was really serene and tranquil, much and most thankfully unlike the hustling and jostling happening on the tower. The ambience was beautiful and really conducive to laze the afternoon away even if you don’t have anything planned specifically for the rest of the day! This entry was posted on June 5, 2015 by Alan (travellingfoodies). It was filed under Food, Travel and was tagged with anko, broccoli, cured tuna, daikon, donburi, furikake, japanese rice bowl, matcha, myoga, nama chocolate, nana's green tea, negi, nori, onsen tamago, parfait, pave chocolat, sky tower, sprouts, Tokyo. Great Pics & write up ,Have a fruitful (eatz) trip in Japan! Will you be going to Jiyougaoka （自由之丘）& Kichijoji (吉祥寺）? many Nice eateries there.